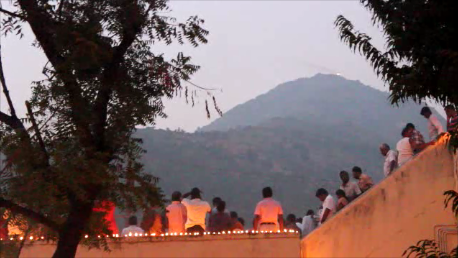 Often people associate worshiping Arunachala Siva with Hindu ideologies . As he is also considered as Hindu God representing a Hindu Ideal . However Lord Siva in its form Arunachala Shiva, has the most inclusive ideology with a foundation of democratic thought of Unity and not uniformity and where all kinds of diversity is encouraged. Naturally, it goes beyond any form of religion. It takes us to the subjective truth of “Self Enquiry” as the highest form of spiritual practice. Long ago , I was sitting in a restaurant just opposite to Seshadri Ashram , having my Breakfast . I had a chance encounter with a Muslim, who had come all the way, from United States and staying in a Ashram here. He was very well versed with some of the celebrated sages of Arunachala , and have came with expectation that he will grow his wisdom in highest proportion with the first time visit in Arunachala. However , he was largely upset with the varied set of rituals carried on here on the ashram , and could not understand any meaning of it. He was very simple and straight on saying to me “ I don’t fly all the way to experience these” . I had to take time to explain , that there many ways people approaches a particular truth , according to the nature of their personalities , like there many ways to go to an pond or any place for that matter. Each of these ways , were helpful for reaching the goal, which was the pond. Rituals were ways , to purify ourselves for making us ready for the love and devotions towards our deity, which could lead us to higher forms of truth . Some people might require these symbolic practice , or some people might not take these path and straight move to the path of knowledge. Like there are many tapasvins who were engrossed in penance and worshiping Sonagiri, subsisting upon roots here in Arunachala, whom you can find in different caves in the mountain . There were also other people who seeing their devotion fell in love with this great Linga and with great fervor began to adore Arunachala, which had first been worshiped by Brahma. In a way , ritualistic worship could not only bring devotion in the person who was conducting the worship, but also it could bring devotion to the whole environment, who was observing the process of worship. MahaRishi Gautama who was describing the glory of Arunachala to the “Mother of Universe” also described about the power of devotion, and how he also fall in love with Arunachala after seeing many Tapasvins conducting there ritualistic devotional worship.